Yesterday, I ink washed a form with three strokes and asked viewers for their interpretations. Of course, I didn’t give any clues to it’s initial design. But, if you’ve guessed a fruit or letter, you’re awesome! It’s the Georgia Peach! 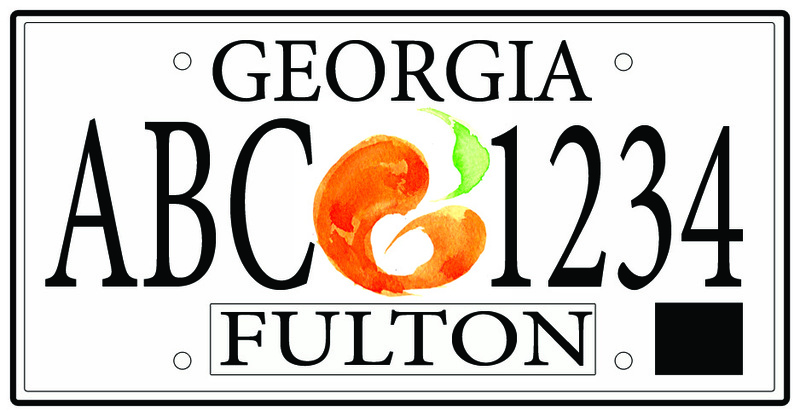 The design was created for the Georgia Department of Revenue License Plate Contest. The Georgia Commissioner is asking local participants to create a design for the new Georgia state tags. The participating winner will receive a commemorative license tag and a certificate of appreciation along with pictures taken with the State Governor, Lieutenant Governor, and Commissioner . Hooray! Karl and I were looking at it. He said “It’s two falcons fighting in the night sky” and I said, “Nah, it’s an apple—-or maybe a peach.” It’s very cool to see it with the colors added!